Socket preservation grafts are bone grafts placed in the socket at the time of tooth extraction. Many teeth that need extractions have existing bone loss secondary to dental decay, teeth break down or abscess, or periodontal (gum) disease. A socket preservation graft may be placed in an extraction socket in an attempt to preserve as much bone as possible when the socket heals. Different types of platelet growth factors are often used with the graft to help the socket graft heal optimally. Typically human bone bank bone is utilized in a socket preservation graft. Occasionally a cow graft material is used. The graft material selected is based upon which product will work best for a particular defect. A membrane is typically used to cover the graft. There is no additional pain or swelling from a socket preservation graft in most cases. All of the pain is from the extraction itself. The patient’s own bone can also be utilized but this involves additional soreness due to the need to remove the bone from another area of the jaw. Use of platelet growth factors helps to stimulate healing and to minimize pain.Socket preservation grafts are usually successful in preserving the patient’s bone to a much better extent than we can obtain if we simply extract and tooth and do not place a socket graft. However, some sockets may still need additional bone grafting. Some of the socket graft can be lost if the wound is disturbed or if the bone in the socket is compromised and does not have a normal ability to heal. A socket graft will not restore the bone to the volume of bone that the patient had when they had a normal healthy tooth and bone. The goal with a socket graft is to make the existing socket bone quality and quantity as normal as possible using a relatively simple technique that does not add any additional patient discomfort. Implant healing is optimal if the bone volume and health is more normal. These socket grafts heal for 3-4 months and then an implant evaluation is performed. Patient’s who have a socket preservation graft are asked to not eat on the area or touch the area with their finger or tongue for one month. In some cases with more severe bone loss we may not initially suggest a socket preservation graft. In these cases bone grafting will be performed in a more comprehensive manner prior to implant placement or at the time of implant placement. Each case is managed individually. Use of this type of socket graft can also be used for patients with bone defects that exist in and about teeth related to pathology in the bone such as a cyst or large bone defect in the bone from infection. A socket preservation graft does not guarantee that a patient will have sufficient bone for a dental implant. 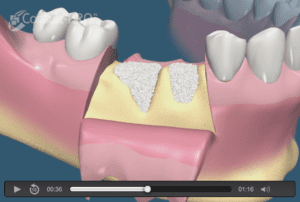 However,socket preservation grafts help to minimize the need for more major bone grafting.